I have a love/hate relationship with working out in the morning. But, as I’ve already shared, I really, really do love it. In fact, it’s one of the best parts of my day — and week even. Well, once I’m done. I’ll admit that getting out of bed in the dark and cold isn’t always the easiest. And it took me months to transition from an evening exerciser to working out in the morning. But the feeling of accomplishment after? The boost of confidence knowing that you already rocked a workout no matter what the day throws at you? Well, that’s just priceless. So if you’d like to start working out in the morning but haven’t quite figured out how to actually get out of bed when the alarm goes off, read on! Morning workouts work best for me, because I usually can find 10 million things to do AFTER a long day at work, and it’s usually not exercise. It was a hard habit for me to get into, but now that I do it, it’s a way of life. I actually DO wake up at the same time every day (even weekends) because it really does make it easier. Staying up late one night, but going to bed early the next, or trying to get to bed early when I’ve slept in? Forget it. I need consistency, and this works for me. I’ve also used Facebook to help get me out of bed. Posting that I will the night before is helpful. I’m also FB friends with my Pilates trainer and one of my cycling instructors. If they know where to find me to harrass me for sleeping, I’d best get out of bed! There are many benefits of working out in the morning. #1 for me is, I have free evenings and if something comes up during the day I don’t feel guilty staying late at work or going for dinner since all my daily exercises have been done. I wouldn’t say that I’m the greatest at being consistent with my early morning workouts. I probably have to go back to having my alarm clock across the room and physically getting out of bed. What helps me if getting a good quality sleep (I recently purchased a new mattress and I’m working on a finding the right pillow). The more rested I am, the more likely I am to wake up to work out. Also, I have found that setting a small incentive for doing at least 3 days a week helps (like purchase a video, new workout clothes, etc). I am the one who has a 100 excused not to workout after work!! I LOVE MORNING WORKOUTS!!! I agree–no matter what kind of day you have—your workout is already done!! I am definitely NOT a morning person and working out in the morning has always been something i’ve wanted to do but never been able to get myself up in the mornings to go to the gym. After work, I always had the excuse that I was too tired to go to the gym. For about 2 months now I have worked out in the morning 5 days and week and I absolutely LOVE it! It wakes me up and I feel like it gives me so much more energy! I should have done this ages ago! Granted, I am only working out at home and for about 20 minutes, but it’s the best way to start my morning!! I workout in the early morning three times per week. It is always hard to get out of bed, but I love that moment in the later afternoon when I catch myself wondering, “Did I workout yet today?” Oh yea! I already did! Woot!” The only time I might suggest not working out in the morning is if you really REALLY are NOT a morning person. Because then, no matter how much you KNOW that it’s good for you, it’s possible you won’t enjoy it, and you’ll dread it, and you’ll start avoiding it. Find the time that works BEST for YOU! Great tips! I love the first one though because it can actually make a big difference. It kind of goes along with that saying “fake it til you make it” sort of. You just have to have a better attitude about it, or at least pretend to at first, and it will come with time. I went went for my first ever early morning run this morning http://wp.me/p1Vei5-fR) and I got a new PR!!!! With my new confidence and your tips, I think I’ll make this a habit!!!! This was just what I needed to read today! Those are great tips! My only problem is that when my alarm goes off I just don’t give a darn and nothing but a fire is going to get me out of bed! I wish it was easier because the times I have actually done it in the morning have been great. I’m fully embracing tip #9 and figure that as long as it’s getting done it doesn’t matter when, but I still hope to conquer mornings one of these days! What time do you early risers go to bed at night?? guys i have a question…. i m doing exercise n running in morning…but i’ve a problem i.e i go to a nearest park for running(as their is a walking track) ,but i go on my bike therefore i have to face the cool breeze on my bike…so when i return back from park,as my body becomes hot,,so when i drive my bike the cold wind puts great effect on me….i wanna ask that is it injurious or bad for my health or body muscles???? help me plzzzz………. i look forward to my morning walks. I have been working out at 5 am during the week for the past month. Knowing that no matter what the day brings, I have done something for me, makes me feel energized. Thanks for all the great tips. I am shifting to a 6:15 am Insanity workout, which is going to be a challenge, since it means I am going to have to get up at 5:00 am to get there on time. Mainly worried about how well I am going to keep up with what is a very fast-paced workout that I am used to doing at 5:00 pm. I hope it works out. I need tips on how to remain quiet while working out early! Sometimes I’m worried I’ll wake up those around me! I belong to the Fitness Center in the office building where I work. I have to be at work at 7 am, and the fitness center is pretty empty early in the morning, so I have been getting up and throwing on my workout clothes, driving to work and hitting the fitness center for 45-50 minutes before showering and heading to work. It won’t get done any other way. I tried going at lunch, but the funny thing is, I actually like to eat lunch on my lunch hour. I figure if I can do this during the dark cold (frigid) winter, should be a piece of cake as it starts getting warmer and lighter earlier. I love this! Morning workout peeps unite!! 🙂 However, I have been horrible the past 2 days…I am going to use your note idea…or maybe an inspirational photo to get me up in the morning! These comments are great motivators! I am very groggy in the morning and need all of the inspiration to get up! My only concern is that I am very stiff in the morning and haven’t had a chance to let the day wake up my body. I’ve actually hurt myself working out in the am! This time, I worked out early evening for approx a month and now I am going to try to do it in the morning. Maybe being stronger will help! I’ve found that the best way to get me out of bed in the morning is to set my alarm as some super motivational audio. Having someone telling me I can do it and that I rock when I first wake up is a great push to get myself out of the house and onto the pavement. I love exercising in the morning, but it’s really hard when it is dark outside. I found the best time to start pushing yourself to get up a little earlier is when daylight savings ends (I know it’s only once a year) as you have that extra hour of sunlight in the morning, so you can get up an hour earlier! …although I’m sure it’s hard for some people as this means we’re heading into winter. I love working out in the morning, but I tend not to do it despite being a morning person. Well, if I work out at home, it wakes up my dogs… who then wake up my partner and our housemate with their barking. If I leave to go to the gym, dealing with talking all the neccessities to the gym to get ready is just my own personal nightmare — and I miss that time with my honey (since he’s in the service industry, and I’m not, we often miss out on time together in the evening, but he’s a delightful human beign who gets up and chats with me when I’m getting ready). I haven’t yet figured out what the solution is, because I really like it when I get to do it! (on the other hand, then I end up trying to do two more through the day… but that’s a different topic). With cup of coffee in one hand and water in the other I stagger into cycling class. Bleary eyed at 5am is my tribal name I gave myself. After just 50 minutes of my life, I’ve burnt some calories, got the vascular system going and feel great. The post glow I try and focus on as I’m driving toward the gym. It’s so working. Morning workout really good for both body and mind. Fresh air refresh our body and mind. Also you can get vitamin D from sweet sunshine. I have always worked out in the evening but I have a toddler now so I find myself either having to rush through it or not doing it at all with my crazy evenings. I will give morning work outs a try and see how it goes. Great article. I like #6, make it mandatory! Thanks for the tips. Amazing Stuff! It’s really helpful for me. Having problem for extra weight. Nice Informative blog!! I felt while reading this, everyone should follow these tips given in your blog. This helps a lot to stay healthy!! Thanks for posting!! The habit of early jogging is the best to keep you fresh and active all day. So try to opt this early running habit as it not only refreshes your mind but also keeps you far away from diseases. I couldn’t agree more! Working out in the morning makes such a difference for me. Also gives me motivation to continue healthy habits the rest of the day. Thanks Jenn for this great article! Working out in the morning always feels better after you’re done but can be so difficult to be consistent and motivate yourself to get up. I feel easing into morning workouts is easiest in the spring/summer when it’s not freezing cold and pitch black outside so I have been telling people to try and start working out in the summer and it will be that much easier when you are already in a routine in the fall/winter. I also find working out in the morning from home is a good way to ease into working out in the morning since it eliminates the time and effort of getting ready in the morning and the commute to the gym. We really enjoy your blogs and website keep up the great work! If you would like to check out our website and product please click the link below. These 9 tips is awesome and help for me,but if you want to loose weight quickly from your body then it is necessary to continue these tips especially tip number 5 .It is awesome and quickly affectable for your body and also fallow the diet plan chart that is assigned you by the trainer of your gym. I also use youtube for waiting different tutorials on best way to burn fat ,but this is the best . question : I continue walk daily in early morning but pain of my back bone is still ? you have any solution than guide me . I love working out in the morning. In that way, I have extra energy for the day! This is a great post! I don’t have any additional tips except to say that the beauty of working out in the morning is you get to have that proud “I worked out today” feeling all day. When I work out in the evenings, I only get to savor that for a couple of hours before bed. morning exercises that will help you feel great the whole day long. You can do them all at home without having to enrol in a gym. Thanks for sharing these 9 tips is very helpful for us, but if you want to loose weight quickly from your body then it is necessary to continue these tips especially tip number 5 .It is awesome and quickly affect able for your body and also follow the diet plan chart that is assigned you by the trainer of your gym. You had an article listed that I wanted to read but didn’t get the chance to. It was something about men & hidden something. ??? Was right below the morning workout. I don’t agree about this point. I love going at it alone! I pop in my favourite heavy metal songs on full volume, bang out a workout routine, and I feel energised, full of energy, ready to attack the day with everything I have. If I workout with somebody else, it turns into some walking and chatting. It just doesn’t have the same energy to it. That being said, I am pretty introverted, it is no wonder I prefer to workout alone. I guess extroverts would prefer to go at it with a training buddy. Any tips on what to eat (or not eat) before a workout? Ive been doing early morning 5am and 6am workouts for the past 2 months. I ate some oatmeal on my first session and I felt like I had to barf midway through. I stopped eating for that reason and as a result I sometimes feel dizzy towards the end of my workout. Other than that, I love the way I feel afterwards! With school, work and a 3 year old.. I am happy I have made some time to work on my self confidence. I love working out in the morning It’s really helpful for me. If you start daily exercise at home by exercise bike or treadmill or others exercise Equipment definitely you can run faster. A lot of great advice in this article. Once you get over the hurdles, getting up in the morning AND working out can be a lot of fun. It’s almost like you just need to remember what you learned about Pavlov and the salivating dogs in high school and train yourself with triggers, actions and rewards until you achieve your fitness goals of getting up in the morning? What kind of treat will I give myself? hmmm…. Your article is very good! New days are always full of energy when you exercise in the morning. I feel that I always maintain a balance when I do it on a regular basis. To stay fit… checkout lifespan fitness treadmill and bikes on our website http://www.nutritionalinstitute.com or eBay store http://www.nijourney.com to buy. You can make an offer to us and we will do our best. Thank you so much for your tips! 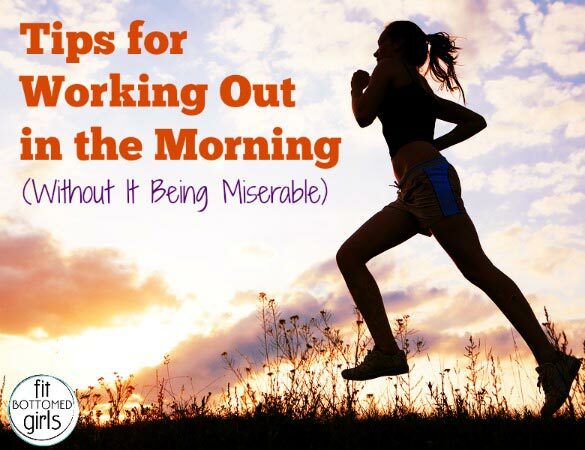 It will surely help those who are looking for Tips for Working Out in the Morning. Thanks for sharing helpful ideas about working out in the morning. I’m a fitness trainer and i usually go to the gym to train them for strength workouts. You can check my article about top 5 chest workouts. Thanks for sharing this great blog it contains lot of information which is very helpful for us i like your work good job. Its very vital to make a time time table for working out in the morning. Running in a constructive manner in the morning really helps in burning fat, increases immune system and also keep your blood circulation normal. Thanks for the sharing your advice. yet, it is difficult to wake up early morning, there is no substitute of a mild morning walk to get a healthy and fit body. it’s not just the calorie, which you burn while walking, but the refreshing breeze gifted by nature, that soothe us, which really matters. Thank you Jenn you reminded us not to forget this task if want to stay healthy for whole life. I am an evening exerciser and i believe it gives me a lot of relax after heavy work schedule. I read your tips and it is really helpful. Yes. Morning workout is always best for your health – fresh air, active brain, easy to workout. I love to work out in the morning 🙂 Thanks for sharing. I love working out first thing in the morning! Morning workouts create a feeling of accomplishment for me and it causes me to watch what I eat during the rest of the day. Thanks for sharing though for me i find it easy to work out in the evening after work since am an evening person. Yes very much agreed with you, for doing exercise in the early morning, and again as you said it’s not an easy task, but once you become habitual, it’ll boost your physical fitness, your perception, your thoughts and eventually your life. Great post! I love the tip about having items set out early in the morning. I’ll usually prepare for a morning workout like I would any other day. What your post has shown me is that the preparation time is usually where I psych myself out. Thanks for the awesome advice in this post. I’m going to put these awesome tips into practice and take back my mornings! Wonderful information. It’s helped me a lot. Many many thanks for sharing with us. thank you fot this great article. its so hard for me to working out in the morning:( I will follow this tips. Absolutely you are right i am totally agree with you exercise is a part of the day and life also exercise makes us good fit and its very helpful to live a healthy life i regularly do exercises specially in morning its a part of my life thanks for posting..
find nice article on your site and love to read it out. I am always prefer to workout in the morning because of hectic schedule whole day and i love to do workout in morning because it freshen up your whole body but also give you different energy that make you active whole day. Thanks for sharing wonderful ideas!! Actually i was looking for this. I was having many of doubts. But your ideas clear my all doubts. Now i am gonna apply your ideas!! Thanks for sharing wonderful ideas!! This is a great article. I think the tips and tricks are especially helpful for young people. As a student myself, it’s hard to find time in the day to exercise in between university classes and part time work etc. However it’s important to realise that exercise doesn’t have to be super long and a quick session in the morning is more than enough. Also, with people who do morning workouts, I think the common trend is that they prefer to do home workouts or they opt for something local like an early morning jog around their suburb. These options are much cheaper than others such as late night gymming which often requires transportation fees since it is too dark to walk or bike ride. Once again, great article. But with all these you need to know what type of workout is best for you? What type of diet should you follow? do you know the reason why your’re not loosing the belly fat? want to get rid of that fat? Quick question…may be silly for some. After your morning workout at the gym, do you then shower, prep for work at the gym? I start work at 7am, my gym opens at 5am. I’m thinking go bare faced and low key, then shower and dress at the gym for work. Any tips to make the transition easier? It would mean carrying other accessories such as work clothes, shoes, makeup, etc. oh. my god waking up in the morning is awful. I hope this tips work. I LOVE working out in the morning! I also HATE getting out of bed in the morning. Quite the predicament. While I hate getting out of bed, when I do, early morning is actually my favorite time of day. I like getting myself together before the rest of the world is up. It’s serene and quiet. I am definitely a snoozer. I’ll have to try putting my alarm on the other side of my room. I usually work out at a gym but I’ve recently taken the pressure off to get there. I define my success the night before. “Success tomorrow looks like a 7 min ab workout, journaling, eating breakfast, etc” It takes away pressure and failure mentality. Thanks sharing this tips. Amazing tips. Keep up the great work! It’s very important to make a routine for exercise in the morning. Running in the morning really helps me to stay fit and also makes my day easy. I am reading your blog on Fitness. It’s really nice and good. You share the negative as well as positive aspects of fitness. Thanks for sharing with us. Keep Blogging.! Doing exercise is good but we have to be very careful while using gym equipment while doing exercise. From my experience, I can say that one of the best way to stay motivated to workout in the morning is to find a buddy. Everything is more fun when you have a friend to do it with. Find someone to goon runs with, and talk about your progression. It is easier to have a friend helping you become fit by encouraging each other to keep going. I hate running in the morning, but completely agree that it gives me such a feeling of satisfaction when I complete it. Running in the morning gives me such incentive to eat good the rest of the day, since I don’t want to ruin my hard work. Nice article, thanks for sharing! Your article is really helpful. Great idea thanks for sharing it! I exercise regularly in the morning and I find it very good for health. Every day I wake up at 5am and I do it every week 4 days 2 4 6 and Sunday, you can go to Gia Dinh Park Ho Chi Minh City and call me. I will not say that I am the greatest in meeting my morning practice. I probably have to go back to have my alarm clock all over the room and physically get out of bed. What helps me if I get a good sleep (recently I bought a new mattress and I was looking for a suitable pillow). The more I rest, the more likely I am to wake up to practice. I’m a morning exerciser. And to get myself going on those early, wet and cold mornings..as I’m getting ready I like to listen to music on my iPod. Adrenalin is pumping and I’m ready to run! Thanks for sharing those helpful tips! I always find when I drag myself out of bed and get to the gym I feel so much better for the rest of the day. The best about it is that you don’t have to go to the gym after a long day at work. Running in a constructive manner in the morning really helps in burning fat, increases immune system and also keep your blood circulation normal. You’re totally right, waking up in the early morning is so good. You’re totally right. Waking up in the morning is perfect!!!! Thank you. It works somehow. Thank you for your healthy lifestyle.